Berthold Seemann in a foreword to W. T. Pritchard’s, Polynesian Reminiscences wrote “ My personal acquaintance with the author (IW. T. Pritchard) dates from the time when I was attached to the Government mission to the Viti or Fiji Islands, when I was introduced to him by a letter from Lord Russell. An able administrator: During my stay in those islands, I had ample opportunities of observing the admirable tact, zeal, and industry displayed by Mr. Pritchard in his official capacity ; how he used to exert himself all day long in behalf of the daily increasing number of white settlers, and of the numerous natives who claimed his interference or appealed to his love of justice ; and how he used to sit up all night, writing dispatches or translating documents, so that no impediment should take place in the next day’s proceedings. Formed code of laws: He was the first who framed a code of laws for a lawless group of two hundred islands; and these laws were so admirably adapted to the primitive state of society then existing in Fiji, that every man of sense willingly submitted to them. A copy of his code may be seen in the library of the British Museum. No one can read the following pages without feeling that he was the .’Right man in the right place” Pritchard was certainly the right man in the right place. It is, therefore, melancholy to add that all his tact, zeal, and industry were unavailing ; that a combination was formed against him, and that this combination was powerful enough, and lasted long enough, to effect his dismissal from the public service. Defense: It is satisfactory to the author’s friends, that the moment he was informed of this, he fastened to London to defend himself; but his letters, begging for a fair investigation of his official conduct, were un heeded ;and after wasting more than a year in London, and spending a considerable sum of money, he was reluctantly compelled to acknowledge that no justice was to be had for him through the channel by which he sought it. …in the following pages : there is hardly an allusion to it, and it is only dire necessity which prompts me to mention the subject at all” . Y H.M. Consul At Samoa Axj) Fiji. PrkfacE By I) Berthold Seemann (R. Seemann). London : Chapman And Hall, 1932, Piccadilly. J. B. Taylor And Co. Editors note: this book appears written by more than one person. One style, in the first person, and care and discretion; other parts in a dramatised third person with a different culture and vocabulary, with the tone of populised ‘missionary press”. These parts were perhaps the parts compiled by editor, Seeman., who says in the foreword ‘Indeed, the abundance of the materials was most embarrassing ; and the ungrateful task of selecting the best stories and the most curious information has in a great measure, especially since the author’s departure for Mexico, fallen to my task as Editor. I may add, that I have endeavoured to acquit myself to the best of my judgment, and that I, not the author, must be held responsible for whatever deficiencies may be observed in the following pages”. I am quite elated to have come across this website and especially your page which focuses on Fiji’s history and that which includes William Thomas Pritchard. William Thomas Pritchard(my great,great grandfather…)George Aillen’s brother was clearly a victim of the circumstances and underhanded political intrigues of the time. I surely agree with Professor Robson in the biography of William T. Pritchard: Prelude to Empire….that it was a “kangaroo court” , with the commission that was sent to investigate any and all so discrepencies and deficiencies in Pritchard’s conduct/actions as Consul. My great, great grand-Uncle did not have a chance as he was already deemed “GUILTY” even before the Commission was formed, even before the said Commission embarked to Fiji. Thanks to Colonel Smythe, Binner,others who found fault when there was none, and the Wesleyan missionaries and the commission as well…who made sure that any flimsy so called “evidence” that didnt hold water…was accepted nonetheless. A mockery of the adjudicative process!! Its amazing that such a group of people should feel so threatened by a single man, whereas his concern was to do what was best for Fiji, whilst the rest of them were embroiled and writhing in bitter jealousy, feeling they would not have the power to control the fijian chiefs. The power handed over to Consul Pritchard, to oversee the interests of Fiji was not done out of fear by the fijian chiefs and their clans….it was given out of trust. Perhaps this is what also added to his demise…the fact that he was able to secure the trust of the Fijian chiefs… take this matter up with King George Taufa’ahau Tupou I…(with regards to Ma;afu and Cakobau)whereas none of them could. 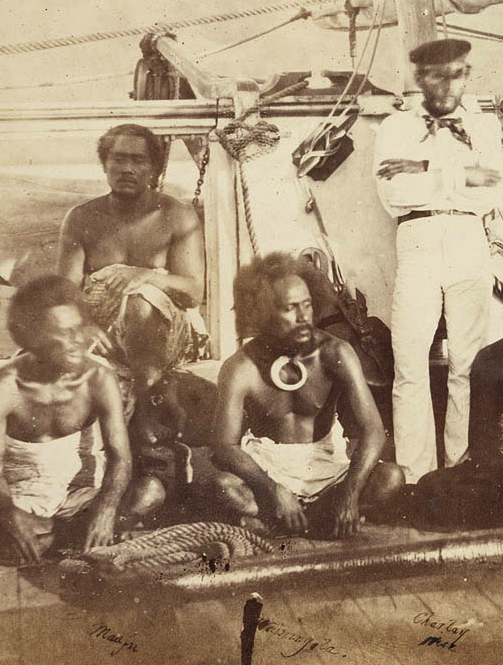 Perhaps if William Thomas Pritchard were not there at the right time…as I believe when he needed to be,..Fijian history would have taken another turn. It would probably be a part of the Kingdom of Tonga. This I believe was not what Pritchard foresaw for Fiji and leaning perhaps on the lessons of the past, especially with his exposure and knowledge of what happened in Tahiti with the Tahitians and the French. With all said and done…it may be the past, but it is still history nonetheless. William Thomas Pritchard will always be a noteworthy hero in my book, irregardless of what the British Government does or say in order to justify the actions and stupidity of their subjects at the time (the Commission,their superiors,Colonel Smythe etc) , what other historians may say or continue to say in order to smear his good name and reputation, to ignore and dismiss his achievements and contributions to history. As always William Thomas Pritchard contributed his time, energy and passion in helping to enrich the lives of others….whilst living in Mexico… thereby enriching his own. In loving memory of my great,great grand Uncle William Thomas Pritchard…You are never forgotten. Good to hear from you, as we sure do have a connection; your great, great grand Uncle,( or was it gggfather- please advise) William Thomas Pritchard, sold my ggg father, Thomas Thompson, the Island of Vanutha Lai Lai. Pritchard had bought it from Cakobau. My gggfather sold it again 17 years later, for some barrels of coconut oil after the family and left, the island, ceased to trade with Fiji, some before 1870. My gggfather was by then Harbour Master of the port of Bluff, New Zealand; then in a boom-time, with the gold rush and shiploads of settlers from Scotland. I agree with you on the pivotal role of WT Pritchard, in Fijjian affairs; he combined the record-keeping and administrative powers of the British with the subtle graces of the Pacific; he was born and raised a Pacific Islander; raised as a Pacific diplomat, saw the theft of Tahiti by the French, spoke the languages of the Pacific; and – I agree with you – appears the one who chose between Tongan control and Cakobau control – of Fiji. In my reading so far, it appears some early missionaries who ran-land-dealing, blackbirding, and coconut oil trading – on the side – felt Pritchard’s decisions tended to damage their prospects; and they succeeded, in an unfair plot, to remove him. I will soon put up some more reports about WT Pritchard; I have not yet read “Prelude to Empire”. But it appears his two small daughters, and his sister, were drowned in a ship wreck just before he left Fiji for the last time. Is that correct, do you know? Please pardon the very late response to your query about WT Pritchard’s daughters and his sister. Yes, they were said to be Lost at Sea(Robson)….shipwrecked., nothing on survivors I remember reading that William T searched the shorelines for weeks, just debris, not a single survivor. I am not sure if he also went to Tonga to search as well. Profoundly tragic and sorrowful. Could I have your permission to repost your article about my gggrand uncle WT Pritchard on my website, with your site quoted as source of article? I would thoroughly appreciate it, as I will be posting some info on the Pritchards later on my site. Per your query…WT Pritchard was my gggrandfather George Ayllen/Ayleen’s brother. WT is my gggrand-uncle. We descend from the missionary’s eldest son…George Ayllen Pritchard. Yes please use the info. Thank you very much …Levuka. I sincerely appreciate your generosity and spirit of sharing!